So much for my resolutions… I didn’t get the chance to write anything since two days ago. From the very beginning when she got her hands on this old Compaq Armada 110, the hard drive, a 10GB IBM Travelstar, had some weird clicks and pops while reading and writing. So I thought I’m doing her a favor if I change it with a 10GB Fujitsu drive I had lying around. Well, not really. The Fujitsu doesn’t make very loud noises during I/O operations, but the motor that spins the plates has a very loud and sharp hiss, which turns out it’s a lot more distracting because it’s permanent and constant, as opposed to the occasional clicks of the old drive. But the best part was that I had to take the damn thing completely apart to reach the hard drive! And tonight I’ll have to do it again, to put the old drive back :). Another really sweet moment was when I discovered the IBM drive has an opening that fully exposes part of the pins, which the other drive hasn’t. And the wise guys at Compaq just had to take advantage of that opening, cramming in the ridge of an underlying heatsink! Needless to say the new drive didn’t fit because of that heatsink’s ridge, so the best solution I could come up with at 2 A.M. was to loosen up the motherboard screws so that I could lift the corner holding the HDD connector just enough to squeeze the new drive in. 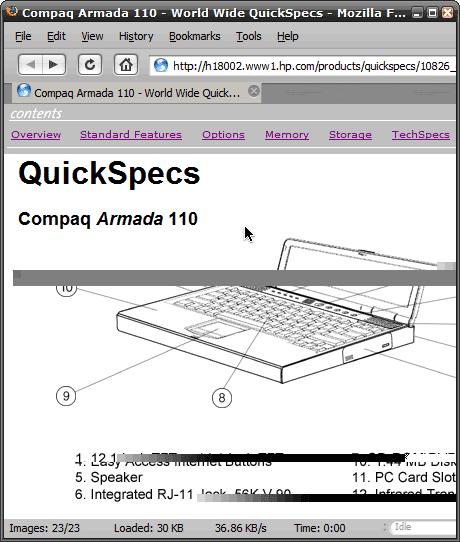 I didn’t feel like laughing back then, but I sure did when discovering the quick specs page above: what an appropriate schematic for this laptop!